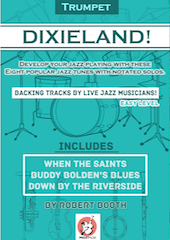 Add some fun and challenge yourself with these great dixieland play-along tunes! Each tune contains a few jazzed up choruses as well as notated improvisation styled solos. (with chords provided if you want to do some improvising yourself). Play along with the provided backing tracks of live professional musicians including banjo, piano, upright bass and drums.